Greetings. A fascinating article by Chico Harlan in Sunday’s Washington Post reports on a startling discovery…that school children in Japan actually love school lunches and their parents routinely ask schools to share their recipes. 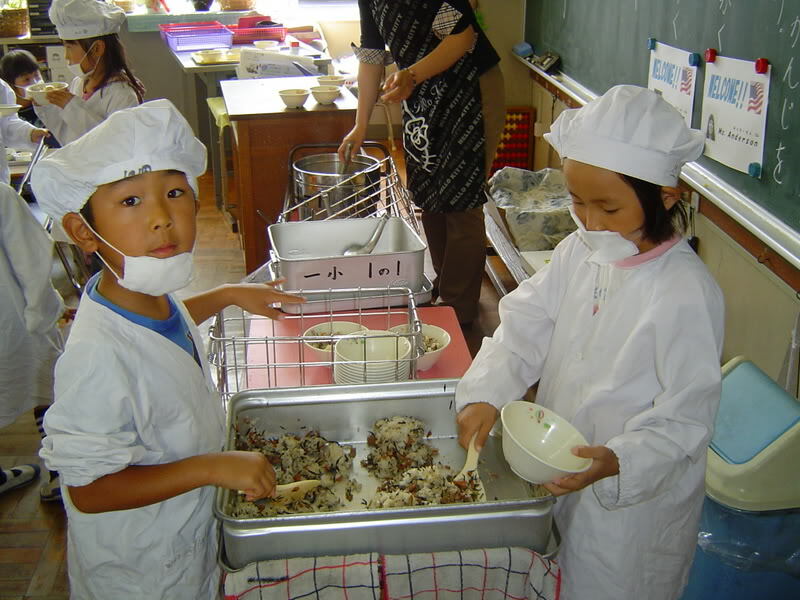 But what makes the story even more amazing is the fact that school lunches in Japan are extremely healthy, nutritious, and made from scratch each day in every school…using mostly fresh and locally grown ingredients. It’s a far cry from the frozen pizzas, french fries, chicken nuggets, fried burgers, and other “savory” treats that fill many American school cafeteria lunch lines. As a result, Japan not only has one of the lowest childhood obesity rates in the world but also the longest life expectancy of any nation except Monaco. So it stands to reason that the U.S. might want to take a page from the Japanese school lunch “cookbook” in our not-so-successful efforts to improve the health and well-being of our young people. Yet, for some odd reason, neither our schools nor the large food and food service companies that play a big role in school meals seem particularly interested in changing the equation. Maybe because it would force them to rethink their business models and their commitment to health. And it suggests that our kids are being held hostage by a lack of innovation and openness to the wisdom of strangers in other parts of the world. Wisdom that could improve not only health, but also school performance. And it begs the question of how open you and your company or organization are to new ideas that are half a world away. Ideas that could challenge you to make your business and its offerings way more healthy and valuable to the customers you serve no matter what industry you operate in. And that might help you to stand out from the crowd in ways that really matter. We win in business and in life when we choose to embrace the simple genius of others. And when we make the health of those we serve our absolute highest priority. Greetings. The world of business and business models is changing very rapidly as innovations in the way we receive and share information challenge "old" ways of doing things. This is especially true in industries like books, music, news, and movies where the digital delivery of content is providing compelling alternatives. Now it's also hovering over the world of video gaming…a world dominated until now by the makers of four incredibly popular boxes–Microsoft's Xbox, Sony's Playstation, and Nintendo's Wii and DS. Their new and seemingly formidable competitor is a company called OnLive which has just launched a "cloud"-based gaming service that could shake up this $15 billion industry. For those of you who haven't spent much time thinking about clouds lately, the idea is pretty straightforward and clever. Instead of purchasing a gaming system, customers can access and play games through a centralized server or "cloud" using their own broadband connection and any desktop, laptop, mobile device, or even TV. This means saving the upfront investment to configure your own system, and having the opportunity to play basically any game instantly. And the implications for equipment manufacturers, software developers, and all of the people who sell video games are dramatic. At the heart of all of this is the big idea that we can substitute services for many products. In this case, that we can buy a gaming service with instant access to all of the world's gaming content rather than buying a box and the physical version of the games. It sounds logical enough, though no one would have imagined it just a few short years ago. Which begs the question of how this change might influence your business or organization, and how you might use the very same idea to drive greater choice and value to the customers you serve. We win in business when we use technology to change our relationship with customers. And when we use our genius and imagination to find wisdom in the clouds. Are your customers looking for better products or better solutions? It's a good question to ask on a regular basis.